A 2-year-old toddler was evaluated for insidious onset of fever, respiratory distress, and weight loss for 4 months. There was a history of contact with pulmonary tuberculosis; tuberculin skin test was negative. Hemogram was normal and resting saturation was 98% by pulse oximetry. Chest radiograph revealed bilateral lower lobe consolidation. Two gastric aspirates were negative for acid-fast bacilli and for Mycobacterium tuberculosis by Xpert MTB/RIF. Human immunodeficiency virus antibodies were negative on enzyme-linked immunosorbent assay (ELISA). Computed tomography (CT) of the chest [Figure 1] showed lower lobe consolidation without lymphadenopathy. Empiric antituberculosis therapy with isoniazid, rifampicin, pyrazinamide, and ethambutol was administered according to weight with no improvement, either clinically or radiologically, at 6 weeks. The child was referred to our center for nonresolving pneumonia. Mycobacterial cultures of the gastric aspirate were reported negative in the meantime. A review of history was prompted by the CT images; it confirmed over-the-counter administration of liquid paraffin for chronic constipation over the last 12 months by the mother. Bronchoscopy and bronchoalveolar lavage (BAL) was performed to confirm the diagnosis. 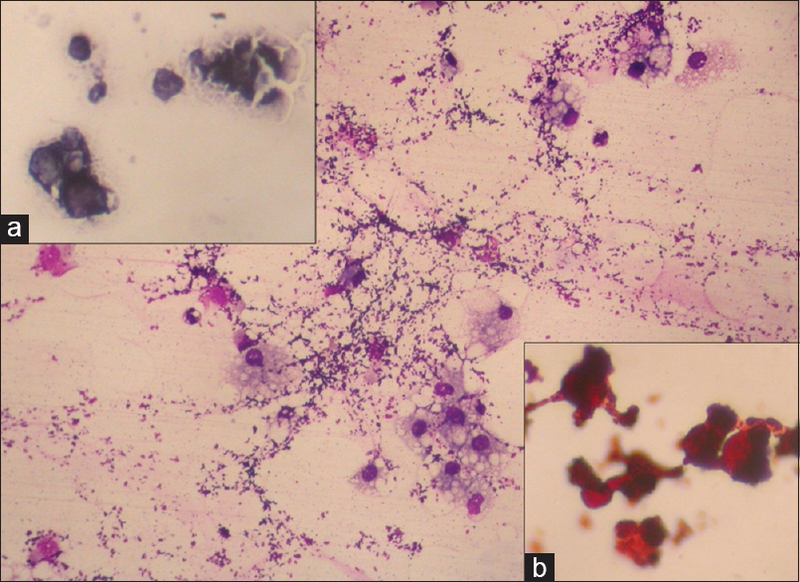 Cytology of the BAL fluid confirmed the diagnosis of exogenous lipoid pneumonia due to passive aspiration of paraffin [Figure 2]. Toilet training and oral lactulose were advised. Liquid paraffin and antituberculosis therapy were discontinued, with significant resolution of tachypnea and weight gain by 4 weeks. Radiological infiltrates have reduced but persist at 6 months after discontinuation of liquid paraffin. Exogenous lipoid pneumonia or “Fire-eater's lung” is commonly caused by either inhalation or aspiration of fat-containing substances such as mineral oil, petroleum derivatives, and laxatives. It must be distinguished from endogenous lipoid pneumonia that occurs when cholesterol escapes from destroyed alveolar walls distal to an obstructing lesion, alveolar proteinosis, or lipid storage disorder. Presentation can be acute or chronic, depending on the load and time to deposition of the inhaled/aspirated hydrocarbon. Symptoms are nonspecific, and may present acutely as pneumonia or insidiously, mimicking an interstitial lung disease or malignancy. Folk remedies involving instillation of oily nasal drops with forceful blowing or use of ghee and sesame oil for nasal secretions, constipation, or abdominal pain is a risk factor. Aspiration while siphoning of diesel or kerosene is a common cause in adults. Lipoid pneumonia has also been reported with repetitive inhaling of oil-based laxatives, lip balm, lip glow, and nasal petroleum-based jellies. In the index case, it was due to passive aspiration during unforced oral paraffin administration for constipation and highlights the importance of detailed dietary, bowel and medication history taking. Lipoid pneumonia is a foreign body reaction to inhaled/aspirated hydrocarbon. The reaction also depends on whether the inciting oil is of vegetable, mineral or animal origin. Vegetable oils provoke little reaction and are largely removed by expectoration. Animal oils cause intense inflammation and fibrosis depending on the content of free fatty acids. Mineral oils are inert and can enter the tracheobronchial tree without stimulating cough reflex. Oil does not affect mucociliary function but impairs movement of ciliary blanket by altering mucin properties. Once the oil reaches the alveolus, it is ingested by alveolar macrophages. Ingested oil cannot be metabolized which triggers apoptosis; oil is released back into the alveolus after macrophage death. There is also a local giant-cell granulomatous reaction to the oil, resulting in chronic inflammation and interstitial fibrosis. High-resolution CT images can often provide the initial clue to the diagnosis. CT shows a homogenous dense consolidation that may be focal or diffuse, unilateral, or bilateral; the most common pattern is a unilateral lower-lobe predominant consolidation. Mediastinal windows may show a low-attenuation consolidation (−20 to − 150 Hounsfield Units) at this stage. When the emulsified oil is removed into lymphatics, host reaction occurs and inflammation and fibrosis lead to a reticular pattern on CT. Partially clearing alveolar oil with lymphatic clearance and inflammation/fibrosis can give rise to “crazy-paving,” a combination of ground-glass opacities and intralobular septal thickening. Fibrosis and coalescence of oil can lead to nodules or masses with irregular margins, mimicking lung cancer. Rarely, cavitation may be observed with parenchymal destruction around large lipid-containing vacuoles. Pneumatocoeles may occur in acute ingestion and result in pneumothoraces. The diagnosis of lipoid pneumonia may be easy in the classic setting; however, in the absence of history as in the index case, a high index of suspicion is needed. BAL, percutaneous, or surgical biopsy for evidence of lipid-laden macrophages using specific fat stains is needed for definitive diagnosis. Exogenous lipoid pneumonia can be distinguished from endogenous lipoid pneumonia by the differential staining appearances to Sudan black, Sudan IV, and Oil Red O. Treatment is prompt discontinuation of the offending agent, treating any complicating infection, and supportive care. Repeated bronchoscopies or steroids have been reported anecdotally but are seldom necessary. Post cessation, symptoms improve steadily, but radiological lesions may persist. Surgical resection may be performed for suspicion of malignancy. With repeated protracted exposures, cor pulmonale can occur. Spickard A, 3rd, Hirschmann JV. Exogenous lipoid pneumonia. Arch Intern Med 1994;154:686-92. Marchiori E, Zanetti G, Mano CM, Hochhegger B. Exogenous lipoid pneumonia. Clinical and radiological manifestations. Respir Med 2011;105:659-66. Laurent F, Philippe JC, Vergier B, Granger-Veron B, Darpeix B, Vergeret J, et al. Exogenous lipoid pneumonia: HRCT, MR, and pathologic findings. Eur Radiol 1999;9:1190-6. Betancourt SL, Martinez-Jimenez S, Rossi SE, Truong MT, Carrillo J, Erasmus JJ. Lipoid pneumonia: Spectrum of clinical and radiologic manifestations. AJR Am J Roentgenol 2010;194:103-9.